Dr. Jeff J. Mollins works hand in hand with referred physical therapists to provide the best care possible for patients injured in accidents. Dr. Mollins has been practicing for over 25 years in downtown Brooklyn. He specializes in the diagnosis, treatment, and documentation of patients injured in accidents. Some examples of these accidents include slip and falls, construction accidents, work accidents (Workers Compensation), as well as automobile accidents (No Fault). A physical therapist is a licensed health care professional who examines and evaluates a patient’s condition and then plans and administers treatments to promote optimal health. Physical therapists seek to relieve pain, improve the body’s movement and function, maintain cardiopulmonary function, restore, maintain and promote optimal physical function, and limit disabilities resulting from injury or disease. Physical therapy treatment is designed to increase motion, heal pain and most importantly RESTORE FUNCTION! In addition, our referred physical therapists (just like all of the other referred specialists) are experts at documentation of all injuries. They are certified by New York State to treat Workers Compensation patients. So if you are hurt at work, you can be treated for free (therapy will be paid by your Workers Compensation insurance carrier) and receive compensation for your lost wages if unable to work. When you return to work, you can still receive treatment at no cost. All referred physical therapists are skilled at handling the paperwork and billing properly so that our patients may receive their needed compensation. Physical therapy is a crucial means of restoring optimal health to patients injured in accidents. 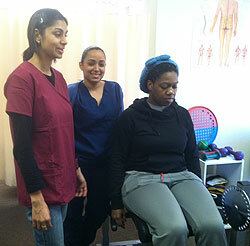 In conjunction with other referred specialists (orthopedics, neurology, pain management, etc. ), Dr. Jeff J. Mollins is able to diagnose, treat, and document all injuries sustained and restore our patients to maximum health.